Around the holidays, putting out a cheese or two in the evenings is a festive way to unwind. For my Di Bruno Bros. column this week, I put together twelve pairings for the season. Here is a selection. To read all 12, please visit the Di Bruno Blog. Day 1: Pears and Stilton instead of a partidge in a pear tree. Day 2: Chutney and Tarentaise instead of turtle doves. Day 3: Nut brittle and French Comté Gruyere instead of French hens. Full disclosure: This is part of a freelance series I write for Di Bruno Bros. Twice a month, I select a cheese and develop a post for their blog. This is how I cover the cost of my dairy habit. That picture is just the cutest! And I am all over the pear/Stilton combo-- yum yum! Chutney and Tarentaise...that sounds heavenly! 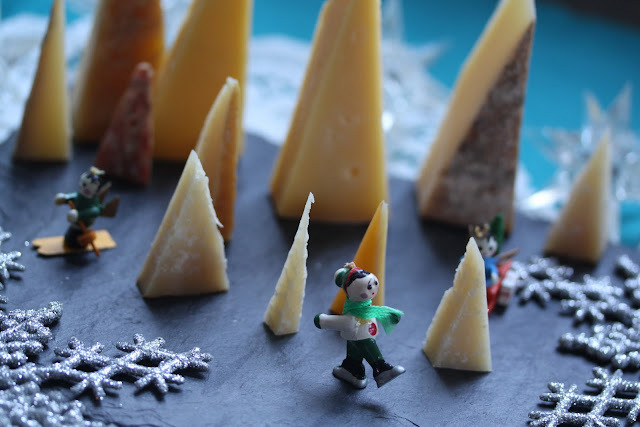 The cheese christmas trees are a very clever idea and a great cheese picture too! You should market that picture to a christmas card company. I regret to say that the linked blog appears to have expired. Is there any chance that you can repost the whole thing here? Thank you! Can the Cheese Ball Be Rebranded?